Putin Seen Unlikely to Let US Strike in Syria Go Unanswered - Integration Through Media ....! 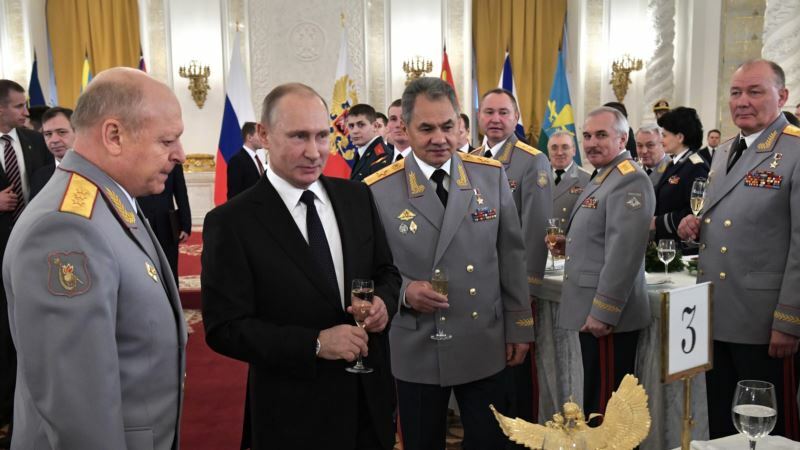 (VOA): Faced with the threat of a U.S. strike on Syria, Russian President Vladimir Putin has a dilemma: Allow U.S. missiles to hit Moscow's ally without a response or risk a military clash with the United States. If driven into a corner by a U.S. attack, Putin is seen as unlikely to sit back. Inaction would threaten his hard-won gains in Syria, dent Russia's prestige and erode his tough-guy image. "It's our president who decides the fate of the world!" ultranationalist leader Vladimir Zhirinovsky declared on Russian state television. During past crises in recent years, Putin has responded by overturning the chessboard. When Ukraine's Kremlin-friendly leader was driven from power in February 2014 by mass protests, Putin reacted to what he described as a U.S.-driven coup by immediately sending troops to overtake Crimea and then annexing the Black Sea peninsula. Ready to fight Commenting later on those developments, he said that he was ready to put Russia's nuclear forces on high alert in case of "the most negative developments" amid tensions with the West over Crimea. He noted that he bluntly warned his Western counterparts that Russia was ready to fight for Crimea. Moscow followed up on that by supporting separatist rebels in eastern Ukraine, and it didn't budge in the face of several waves of crippling U.S. and European Union sanctions. When Syrian President Bashar al-Assad's government was teetering on the brink of collapse in 2015, it took Putin just a few weeks to mount a military campaign that saved Russia's longtime ally and eventually turned the tide of war in his favor. In recent documentaries, Putin has shared candid memories of his youth in a working-class neighborhood of St. Petersburg — then known as Leningrad. He said he learned lessons there that have lasted a lifetime. "The streets of Leningrad taught me 50 years ago that when a fight is inevitable, you must strike first," was one of the recollections. Another telling episode was an encounter with a rat in a seedy entrance of his crumbling apartment building. After he cornered the rodent, it turned back on him and attacked. "She ran forward and chased me, jumping from one flight of stairs to another and even tried to leap on my head," he recalled in an interview for a recent documentary. "You shouldn't try to corner anyone." A year ago, Putin was nurturing hopes for better ties with the U.S. under President Donald Trump. After a purported chemical weapons attack in Syria, he allowed a U.S. missile strike on a Syrian air base to go unanswered, apparently trying to leave the door open for better relations with Washington. Moscow, which had received a tip from the U.S. to get its servicemen out of harm's way, limited its response to angry statements of protest. With Kremlin expectations of a cozy relationship with Trump fizzling amid U.S. investigations into allegations of Russia's meddling in the 2016 U.S. election, Putin is unlikely to show such tolerance now. Warning about false claims Weeks before a purported chemical attack by the Syrian government on April 7, the Russian military warned the West against what it described as false claims of chemical weapons use to strike Syrian facilities. The head of the Russian military's General Staff, General Valery Gerasimov, warned last month that a U.S. strike would threaten Russian military personnel in Syria and draw a Russian counterstrike against both U.S. missiles and the ships and aircraft launching them. The statement signaled Moscow's readiness to protect its ally even if it entailed a direct clash with the U.S. With tensions running high, Russian warships sailed out of their base in the Syrian port of Tartus in what retired General Vladimir Shamanov, the head of the foreign affairs committee in the lower house of the Russian parliament, described as a maneuver to avoid a possible U.S. blow. Russia has several dozen warplanes at Hemeimeem air base in Syria, along with an array of state-of-the-art air missile defense systems and the Bastion missile systems protecting the coast. The missiles have a range of up to 450 kilometers (280 miles). In case of escalation, Russia could use air bases of its ally Iran to deploy more aircraft closer to Syria. Russia has used Syria as a testing ground for its new weapons, including some long-range missiles. These included the sea-launched Kalibr and air-launched Kh-101 cruise missiles; both can be fired from the Caspian Sea and other areas in western Russia. Russia's U.N. Ambassador Vassily Nebenzia said the top priority is to avert war in Syria and didn't rule out the possibility of a U.S.-Russian conflict. He told reporters after a closed emergency meeting of the U.N. Security Council on Thursday that "the danger of escalation is higher than simply Syria," adding: "We hope that there will be no point of no return — that the U.S. and their allies will refrain from military action against a sovereign state." Tips for public about attack Reflecting the mounting tensions, Russian television and other media offered tips for the population in case of a nuclear attack. Prime-time talk shows on Russian state TV featured senior lawmakers and military experts engaging in heated discussions of possible scenarios of a clash between Russia and the U.S., all the way to an all-out nuclear war. Military expert Mikhail Khodarenok argued that Russia must retaliate against any U.S. strike, saying a failure to do so would badly dent its reputation. "It will mean geopolitical shame and colossal reputational losses. We can't risk losing our face," he said on Rossiya state television. "America, get ready for our old reliable 10-megaton nuclear warheads." Alexei Pushkov, the head of the information affairs committee in the upper house of parliament, struck a more moderate tone, saying that Russia has powerful conventional weapons to fend off a U.S. attack in Syria. "We must avoid a nuclear conflict," Pushkov said. "We must protect our ally Syria without falling off a nuclear precipice."